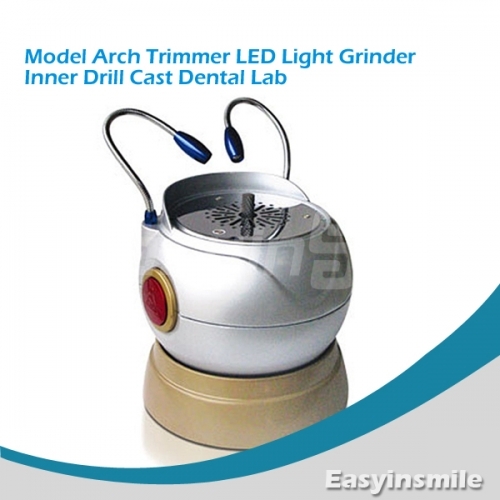 New Dental Lab Model Arch Trimmer Ball Type with LED Light by Easyinsmile (HK) business Co. This arch trimmer comes with new configuration and ball shape and it is necessary equipment for trimming the sides of plaster models. 1.Its spherical machine part can be work at 40° incline, so it can meet all the requirement of working ways and angle requested. 2.It greatly improves the working efficiency and precision. 3.It is a new kind of model trimmer with two LED light and it don’t need connect water,can be connect to vacuum cleaner.